Thunderbolt Casino has just brought the most adorable slot game ever made to South African online casino players. 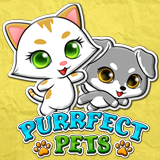 Purrfect Pets is a 25 payline wide screen, high resolution game with generous bonus features. The casino, where all games are played in Rands and customer service is available in both English and Afrikaans, has an introductory casino bonus until the end of May. Valid until May 31, 2017 only. South African online casino introduces cuddliest slot game ever! You'll love Purrfect Pets’ frisky little puppies and animated kittens. Serious slots players will appreciate this game’s many bonus features that can really add to your winnings. Cat Wilds award 10 free games where all prizes that include a Wild are tripled. Three or more scattered Dogs award 10 Free Games with doubled prizes and both Dogs and Cats are Wild. There’s a randomly triggered feature that can award the Doggy Dollars, the Wild Cat or the Random Riches feature after any regular spin. Purrfect Pets is available in Thunderbolt’s mobile casino for smartphones and tablets as well as its instant-play online casino and downloaded casino software.